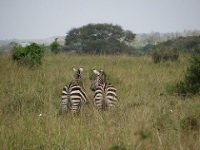 Nairobi National Park was established in 1945 and is Kenya's first national park. Uniquely situated on the capital's doorstep it is a well-kept, compact and beautiful area of plains and wild bush containing a large number of Africa's best-known animals. Large herds of zebra, wildebeest, buffalo and giraffe roam the plains and black rhino, ostrich, baboons, cheetah, leopard and lions are some of the other photogenic inhabitants. In the park is the Animal Orphanage where sick, wounded and abandoned animals are cared for and rehabilitated into the park, as well as an Educational Centre featuring a Safari Walk. Other attractions include the Ivory burning site Monument and some wonderful picnic areas popular for corporate functions, weddings and the like. Close by is the Sheldrick Elephant Orphanage, where infant elephant and rhino (orphaned because of poaching activities) are cared for and eventually returned to the wild in Tsavo National Park. The centre is open every morning and visitors can watch the calves bathing in the mud hole and being bottle fed by their human surrogate mothers. Seeing these baby animals playing and interacting with them is a special experience and the Elephant Orphanage is one of the top attractions in Kenya for many visitors.